Anita Haidary is a 21-year-old woman from Kabul, Afghanistan, who is the founder of an organization called Young Women for Change, fighting for women’s rights in her home country. Anita is passionate about film-making and the power and value it holds among its viewers as well as about understanding the complicated political and social systems in the world. She is a senior at Mount Holyoke College. 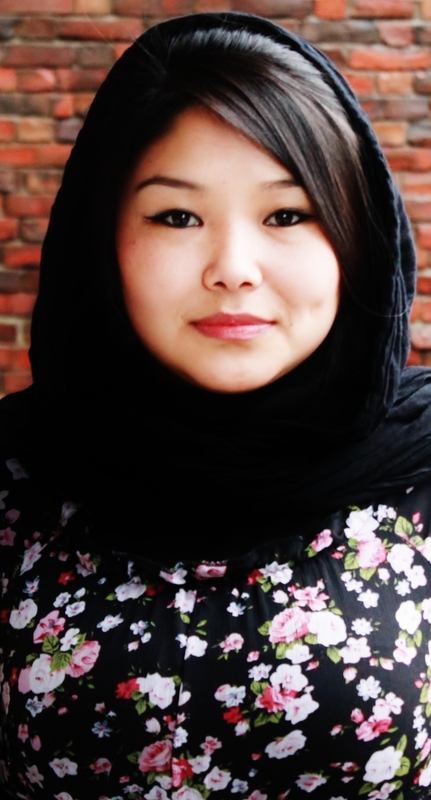 She decided to study in the U.S., because she considered education in Afghanistan too authoritative and she wanted to study film, while in her native country there are still no film schools. Anita’s organization, Young Women for Change mostly works in Kabul, with some projects taking place in Heart and Jalalabad, which are cities with many volunteers. Her organization is currently aiming to access other provinces as well. Initially, she intended Young Women for Change to be a ‘movement, a platform for women to come and talk about their issues, otherwise neglected.’ In order to avoid issues with the government, she decided to formally register Young Women for Change as an organization. Part of her decision to act also came from her own personal struggles in and disapproval of the Afghani school system teaching girls to be weak, scared and vulnerable. Anita came from a family which taught her to think critically, where her opinion was valued since a young age and she recognized her own power.In her own family, she realized her self-importance and felt capable of achieving anything. At the same time, until the sixth grade, Anita studied and lived Pakistan, where her family had fled during the 1997 war. They returned to Afghanistan in 2002, in hope for a better future. Anita was introduced to a repressive school system that disempowered girls. She gradually came to realize that she was needed to fight for her and other girls’ and women’s rights. That is why, during high-school, Anita started engaged in women’s work, by organizing projects and events to raise awareness about women’s rights. Anita’s key goals with Young Women for Change is ensure that ‘women stand for themselves, become leaders, see problems of their own, problems they are facing in society, come up with solutions, plan and then implement the plan to solve the issue.’ She believes that, in order to achieve this, women cannot be socially isolated, as men need to actively contribute as well and understand the importance of gender equality. Young Women for Change organizes numerous programs and activities focused on local women’s needs. The organization has held lectures about rights of women in Islam, while also organizing campaigns, film screenings and lectures to raise awareness about domestic violence and the importance of educating girls. It also created sister sessions for girls to discuss their social issues that they might not otherwise have a chance to address. Anita’s agency also does advocacy, in order to pressure the legal systems in Afghanistan to advocate for women who face murder, domestic violence, street harassment and child marriages. Anita believes that women are key to change, because improving their lives automatically means bettering 50 percent of society and ensuring overall social development. She also believes that, since it is their lives that are affected by decisions made on their behalf by men, it is essential for women to stand up for themselves and act for change. Most of the organization’s work does not require funding, a attribute which Anita believes is important as the volunteers’ work is the core of the organization. However, whenever, the organization needs funding for a project, they use online fundraising, organize events, such as exhibitions, and receive donations to raise the needed financial resources. Anita considers creating and successfully running her organization since a very young age as well as shooting a film about street harassment to be her greatest accomplishments to date. In terms of challenges, the young change-maker sometimes finds it difficult to balance her academic responsibilities with her social work. She has also received physical threats for her work and has discovered that it is difficult to find volunteers in Afghanistan, given that people are fighting for their survival and only extremely committed people decide to volunteer. As for her upcoming plans, on the short-term, Anita plans to graduate, work for a year and start graduate school, while on the long-term, she wants to expand the work of her organization and make viewer-appealing and inspiring films about social issues. After finishing her masters’ degree, Anita plans to return to Afghanistan, in order to contribute to the country’s development.